After severe weather passes, it’s important to assess any damage and begin cleaning up the mess that Mother Nature has wrought. Some steps, such as using chemicals to sanitize the water, are common sense. But others may not be. And a few actions are best to avoid altogether unless properly performed. In the aftermath of nasty weather that muddies up your pool, here are five missteps you want to bypass. Mistake #1: Draining the pool water. It’s tempting to empty your swimming pool after a violent storm or hurricane leaves behind filthy, discolored, debris-filled water. But don’t do it! If you drain even four or five inches of water from your pool when backyard soil is still wet, you take a huge risk: Your concrete pool shell could shift its position within the ground or even “pop up” out of the ground. Here’s why: The earth surrounding your pool’s concrete shell is constantly exerting pressure on the structure’s sides. But the water inside your pool is heavy, so it counteracts all that pressure and keeps the shell weighted down in place. Removing water reduces the pool’s overall weight, making it more susceptible to the pressure, which could push it up out of the ground. 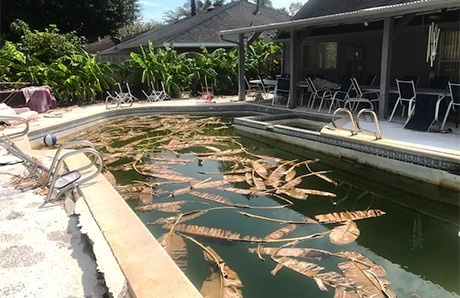 The danger increases with water-soaked earth: After heavy rain or flooding, groundwater can seep underneath an empty pool or even a partially drained pool. Without the full water weight to counter the pressure from below, the now-lighter structure can lift up and pop out. Now if the dirt-and-debris load is so immense your pool truly needs draining, be patient. Wait until the surrounding ground has dried out. Depending on the weather and the kind of soil in your backyard, that can take several days or even several weeks. But even when the last bit of moisture is gone, it’s always advisable to call out a pool service company to perform this risky task; let professionals handle it. Mistake #2: Removing debris without equipment or protection. To begin your pool’s revival process after weather damage, you want to clear out as much floating and large debris as possible. But never use your bare hands or expose your skin to the pool water. You can use cleaning accessories like a pool rake or a skimmer net for a portion of the small and medium debris. But large objects that have made their way into your pool, such as tree branches or outdoor furniture, may require a manual clear-out using your hands. In these cases, safety precautions are in order. You can use a solid pair of waterproof gloves when picking out items from the water. You don’t want exposed hands and arms to come into contact with contagious microorganisms that may have entered your pool during the storm! And of course, never hop into the pool and expose your skin to possibly contaminated water to pick out debris. If you have the slightest concern about nasty pollutants, chemicals, bacteria, or viruses after a major storm, it’s best to hire a pool professional to handle the cleanup. 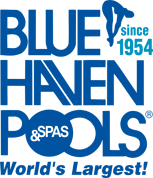 Mistake #3: Turning on pool equipment without prior checks of electrical system and components. Before flipping a switch on your pool equipment pad, it’s critical to assess the power system. Flooding or heavy rain can mean water damage to the power grid or certain equipment parts. Before the storm, were you able to turn off the breakers and all of the pool equipment—including any automatic equipment timers? If so, chances are higher the system and components survived without damage. However, if your power was on during the storm, or, if a timer activated equipment like the pump, the odds are less favorable. A breaker exposed to water may have blown, or a pump motor may have water damage. If the GFI resets, try switching on the pool light. If the GFI will not reset, then something is wrong with either the GFI or with your pool light, and it’s time to call the electrician. If your pool light does turn on, the next step is to test the pump. Visually inspect the pump’s motor. Look for debris, water drippings, or water rings around it. These are signs that point to water infiltration. If you see any of them, do not turn on the pump; doing so may damage it. The safest approach is to call a pool-service technician to come out. The last thing you want to do is make the situation worse than it already may be by turning on the power and ruining the pump motor or damaging any other components connected to the electric panel. On the other hand, if your pump motor appears dry, check your electric panel for the pump breaker. If the breaker has not tripped, you can try turning on the pump. If the pump breaker has tripped, call an electrician; most likely, it means that water seeped into the pump’s motor—even though it looks dry. Mistake #4: Using your automatic pool cleaner too early in the process. It’s best to avoid using your pool’s automatic, roving pool cleaner right away. Whether you have a suction-type, pressure-type, or robotic-type pool cleaner, the heavy workload will be too much; capturing so much debris will likely clog it up. Also, using a roving pool cleaner too soon can prolong the cleaning period. The cleaner’s action and sweep hoses stir up dirt and debris, putting them into suspension. However, after you first manually remove floating and larger debris from the surface of the pool, you want remaining dirt and small debris to settle at the pool bottom. There are a few reasons why. First, depending on how the main drain(s) in your pool is plumbed, dirt that’s settled—versus floating around—is easier for the main drain(s) to trap and remove. Another reason is that settled dirt may be preferable is for vacuuming. If you plan to attach a cleaning vacuum to the skimmer line, it will be easier to use the device along the pool’s bottom to capture dirt and debris. However, later in the process, you can use your automatic cleaner. Wait until you have vacuumed the pool or after your main drain has removed settled dirt. A good guideline is this: When you can see the main drain (in the deepest section of the pool) through the water, it’s time to re-introduce your automatic pool cleaner and let it go to work. Mistake #5: Running the pump without extra care for the filter, skimmer, and pump basket. If your pump is operational and is helping clear out your pool of debris, be prepared to let it run 24 hours a day, for several days or even two weeks—until the pool water becomes clear. While the pump works those first days circulating debris-laden water, several other pool components will very likely require extra attention! Depending on how much small debris found its way into your pool water, the filter media—whether a sand, cartridge, or Diatomaceous earth (DE) model—will quickly fill up. The best approach is to clean out your filter before you activate the pump. That way, it has the maximum available storage capacity to start off the job of trapping dirt from the water. When the filter is clean, take note of the pressure gauge reading, which will come in handy later, as noted below. With the high debris loads, you may need to clean out the filter as frequently as once per day for several days or even longer as needed while it captures dirt and small debris. Watch the pressure gauge; clean the filter media when the gauge hits 10 PSI more than the gauge showed when the filter was empty. A similar cleaning routine applies to the baskets on your pool pump and skimmer. As you run the pump the first several days, both receptacles may rapidly fill as they catch debris. Check them periodically to see if they need emptying. In particular, the pump basket may require additional clearings for a week or longer. Failure to maintain the extra housekeeping needs for the filter, the pump basket, and the skimmer basket will bring nothing but trouble. As these components’ storage capacities overfill, their performance will suffer. Progress on your pool’s restoration will stall. In fact, a clogged pump basket can cause the pump motor to overheat and shut down. Avoid issues with diligent cleaning. Be smart cleaning up after a major storm. It takes patience and persistence to clean up your swimming pool after a major storm or hurricane. Be strategic and steer clear of the mistakes outlined here. Err on the side of caution. Call an electrician or pool technician if you suspect that water has flooded the pool equipment or power system. If your pool is in such bad shape it looks like it will need to be drained, contact a pool-service professional to take on the risky procedure. With the right approach, soon enough your pool will be back in the business of serving as an oasis for family fun and relaxation.